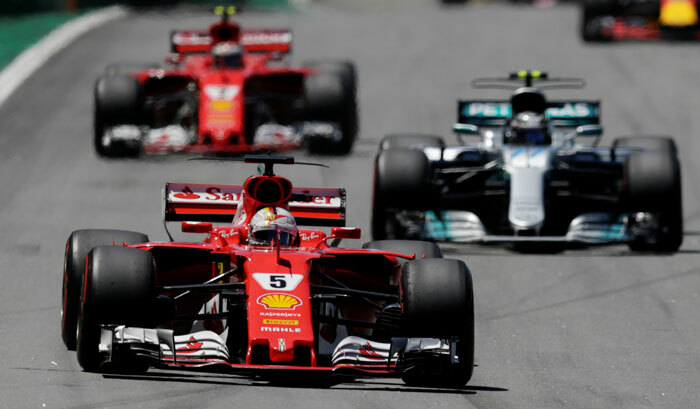 Ferrari's Sebastian Vettel won the Brazilian Grand Prix on Sunday while Lewis Hamilton fought from the back of the field to finish fourth for champions Mercedes. Hamilton, who clinched his fourth world championship in Mexico two weeks ago, started from the pitlane after crashing in qualifying but led the race after 31 of 71 laps when others pitted. The Briton was already up to ninth after 10 laps, with the safety car deployed after opening lap collisions. Valtteri Bottas, who had started on pole position for Mercedes, saw his hopes of overhauling Vettel for the runner-up position in the championship effectively disappear when he finished second. Fellow-Finn Kimi Raikkonen held off Hamilton to take third for Ferrari.